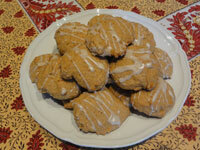 There are awfully easy to make and to eat! Preheat the oven to 325 (conv.) or 350 (reg.) degrees. Line two cookie sheets with parchment paper. In a large bowl with a wooden spoon, mash the butter. 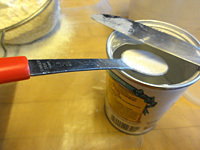 Let stand while you measure the dry ingredients. Cream the butter into the sugar. 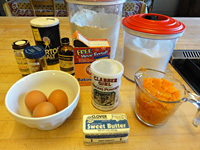 (This can be done by hand or with an electric mixer.) 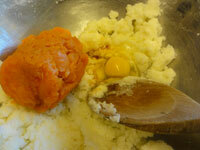 .Stir in the pumpkin; then mix in the egg and vanilla. Mix in the dry ingredients. Drop by spoonfuls onto the lined cookie sheets and bake in the preheated oven until golden on the bottom, about 12 minutes. Remove from the oven and let cool in their pans on racks. 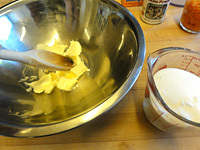 In the meantime, sift the powdered sugar into a bowl and stir in the milk, butter, and vanilla. 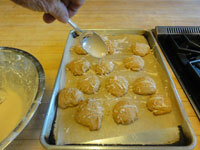 With a spoon, you can simply throw lines of the sugar glaze across the cookies. Note: What I like to do is grind whole spices together in a spice (or coffee) grinder to give them a stronger taste. I also put a big old yam the 375 degree oven for about 40 minutes to make my own mashed yam instead of using canned pumpkin.